Just a drive down the road from East Knox Schools, located on Pipesville Road is the Memorial Ball Field in Howard, Ohio. This ball field hosts ball games to girls ages 5-16 with all skill sets and began construction in 2014. Future plans for this amenity include an additional softball field, a pavilion with a concession stand, and a playground for kids to play and stay occupied while their older siblings take a swing at their skills on the dirt. We have shared custom drone footage below that captures the Memorial Ball Field in a unique perspective including a very cool lift off taken from the pitcher's mound as well as 360 degree views around the field that captures the surrounding landscaping. Many thanks are due to those who've contributed donations and hard work to what has become the Memorial Ball Field of Howard, Ohio! Thanks to the generous community donations and hard work, this dream has been turned into a reality. 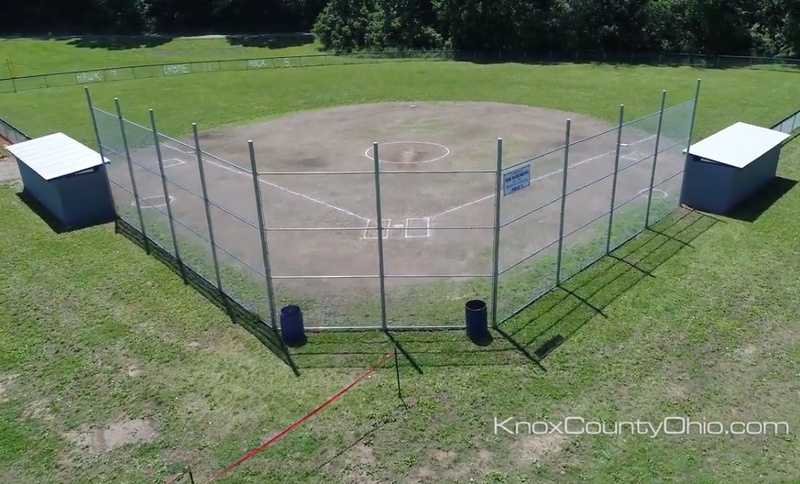 Anyone interested in contributing to the future plans for the Memorial Ball Field in Howard, Ohio, please feel free to contact Kevin Patrick at 740-627-6773. If you love visiting the Memorial Ball Field in Howard, Ohio, considering making Howard, Ohio your new home. Click HERE to find homes for sale in Howard, Ohio. Click HERE to find homes for sale in the East Knox School District. If you love exploring nature, taking photos of the outdoors, or going on hikes, the Honey Run Waterfall in Howard, Ohio is the perfect place for you to visit. This park offers gorgeous views of its 25 foot high waterfall and provides two bridges and a staircase that protects the ecosystem and natural resources of the park as well as providing safety for each visitor. Make sure to take a look at the blackhand sandstone cliffs and boulders that add a unique touch to the park, formed over 350 million years ago! This park also is the habitat for uncommon plants such as the Eastern Hemlock, witch-hazel, round-leaved hepatica, partridge-berry, and wild ginger. Honey Run Waterfall also provides hiking trails that reach the kokosing river, family friendly exploration, and many opportunities for beautiful photography. Check out the drone footage below to see just how beautiful and captivating Honey Run Waterfall is. 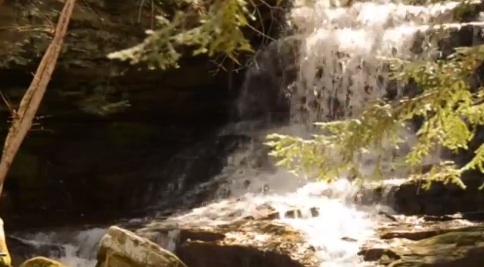 Honey Run Waterfall is located at 10855 Hazel Dell Road in Howard, Ohio 43028 and is open 365 days a year. Bring your camera because you are in for a real photo opprtunity when you visit the Honey Run Park in Howard, Ohio. One of the major highlights of this country park is the gorgeous 25 foot tall waterfall that cascades over beautiful stones. You can hike from the Honey Run waterfall all the way to the Kokosing River experiencing gorgeous wooded areas, sandstone cliffs and large boulders. If you would like to visit the Honey Run Park the street address is 10855 Hazel Dell Road, Howard, Ohio. From the intersection of Route 62 and Coshocton Road / US 36, Honey Run Park is 2.37 miles (just a couple of minutes). 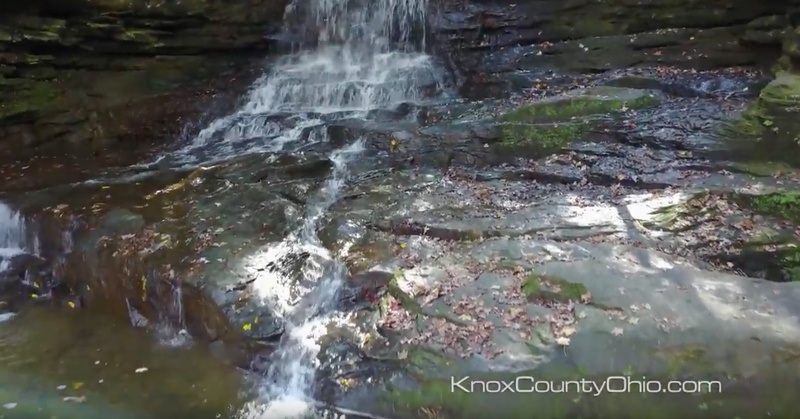 According to the Knox County Parks District, "the Honey Run Waterfall site contains a rare plant community (disjunct, boreal habitat) and unique views of the Blackhand sandstone, formed some 350 million years ago. Towering hemlocks, partridge berry, witch hazel and rue anemone grace this natural area". This community feature is part of our ongoing series titled "365 Things To Do in Knox County Ohio by Sam Miller". Knox County Ohio is the geographic center of Ohio and is located within 40 miles of Columbus and Polaris, within 105 miles of Cleveland and within 154 miles of Cincinnati. Knox County is also within 22 miles of Newark, Ohio and within 24 miles Lexington, Ohio. Once an active branch of the Pennsylvania Railroad, the Kokosing Gap Trail offers Knox County residents a relaxing and very scenic means of exercise and recreation. Opened in 1991, the Trail is a 10-foot wide paved path that stretches 13.5 miles from Mount Vernon to Danville. Along its course, the Trail follows Knox County’s scenic Kokosing River and surrounding countryside. Forested hills, wetlands, family farms, and the river itself offer pleasant scenery, and many opportunities for memorable photos. Beginning in Mount Vernon’s Phillips Park, the trail runs east to historic Gambier, the home of nationally respected Kenyon College. Here, one can stop for a rest at one of the Trail’s restroom facilities and take photos with one of the Trail’s travelers from the past: and old steam engine, coal car, flatbed and caboose; a standing reminder of the legacy of America’s once great railroad system. From Gambier, the trail continues northeast towards Howard, where the beautiful Apple Valley Lake and resort are located. Here, Trail goers will pass underneath Route 36 through a stone-arched tunnel, and then continue on towards Danville. It is in Danville where the 13.5-mile Kokosing Gap Trail ends, but if one wishes to travel further, the Mohican Valley Trail, which opened to the public in 1999, begins only a few blocks from where the Kokosing Trail ends. Many people use the Kokosing Gap Trail. Its close proximity to Mount Vernon Nazarene University and Kenyon College in Gambier makes it an excellent place for college students to get away from the stress of campus life and prevent the infamous Freshman 15. It is a great way for families to spend peaceful, quality time together, and instill in young children good exercise habits and a respect and love of nature. The Trail is an excellent way for anyone, of any age, to get the exercise needed to live a healthy, happy life. The Trail is also a great place for nature lovers. In addition to the common squirrel, chipmunk, and deer, the Kokosing Gap Trail is also a great place for bird watchers. One of the most inspiring sights at the Trail is the rare spotting of the American Bald Eagle. At least one mating pair is reported to soar the skies along the Kokosing River, making the Trail one of the best places to try and spot this majestic, once endangered, bird of prey. With the 4th of July fast approaching, the spotting of the American Bald Eagle within Knox County could be one of the most memorable sights of the summer. Parking for the Kokosing Gap Trail can be found in Mount Vernon, Gambier, Howard, and Danville. The trail features several river crossings on wooden-decked steel bridges, a few of which include observation decks where people can rest and take in the scenery or take a few photos. Recently, there has been some talk on extending the Trail to also run north to Fredericktown, Ohio. The Kokosing Gap Trail is a beautiful, relaxing stretch of path, which is enjoyable to people of all ages and backgrounds. Whether biking, walking, running or skating, the Trail is an excellent venue for exercise and shows off the beauty and rich history of Knox County.